This chart covers the week commencing April 8th to April 14th. Fortnite remains the top dog for another week, bringing in over 32 million hours watched this week. However, the title did drop 5.3 per cent of views. League of Legends sits in second place again, and its views for last week were almost the same as the views it racked it up the week prior, so no real change. Grand Theft Auto: V stays in third, dropping 4.2 per cent in views but not moving anywhere. 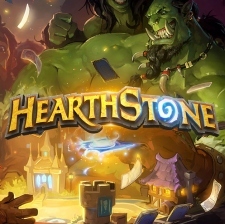 Hearthstone makes its return to the chart in fourth, after a huge 123.8 per cent increase in hours watched in the last week. The release of a new expansion has seen streamers return to Blizzard's popular strategy card game. PUBG Mobile remains in fifth, unscathed by the success of Hearthstone. CS: GO falls to sixth after a 16 per cent decrease in hours watched over the last week. 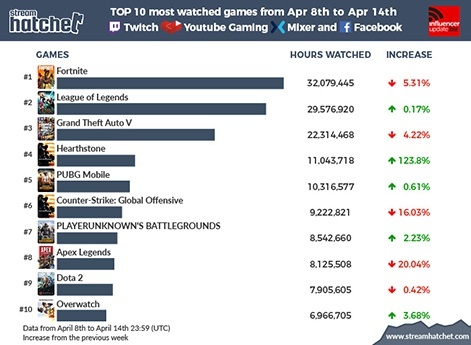 PUBG takes seventh for another week, and a 2.2 per cent increase in hours watched keeps it a step ahead of Apex Legends, which has fallen to eighth place. Respawn's battle royale took a 20 per cent hit to its views in the last week. Dota 2 falls to ninth place; it only experienced a 0.4 per cent decrease in views but Heathstone's entry has sent it lower than it should have been. Overwatch is closing the chart again, not managing to move from tenth place despite a huge surge in hours watched the week before last.